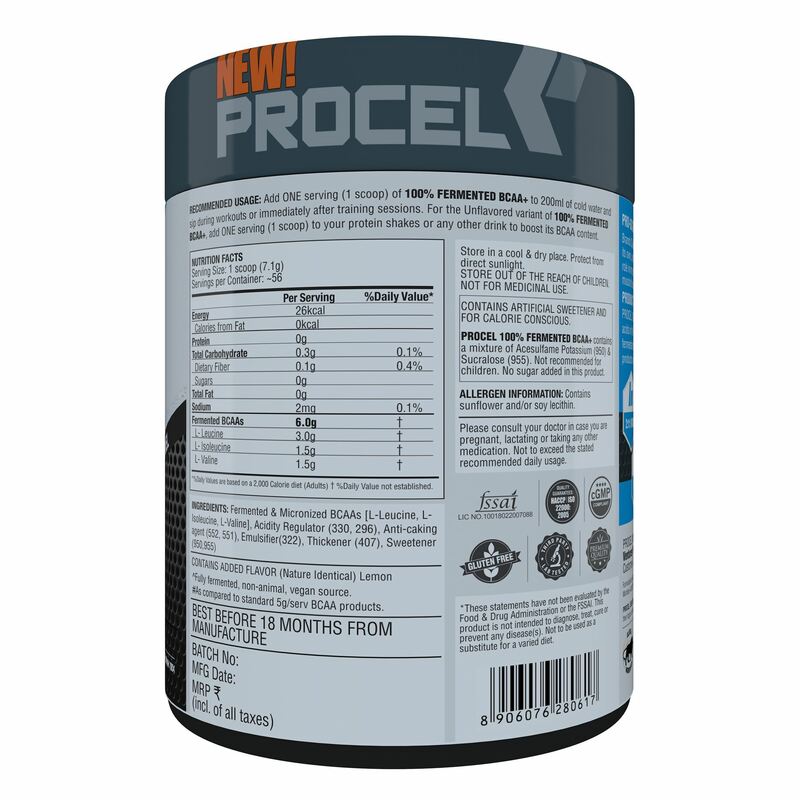 Each serving of PROCEL 100% Fermented BCAA+ provides 6.0 gms of branched-chain amino acids (BCAAs) in a 2:1:1 ratio. PROCEL BCAA+ is entirely derived by fermentation from 100% plant-based sources instead of the bird feather or human hair based raw materials as used by other brands! As always, all PROCEL amino acids are instantized and micronized for superior absorption and bio-availability. BCAAs are considered essential amino acids because the body cannot make them on its own. They must be provided from food. Besides playing a key role in muscle repair, BCAAs are also oxidized for energy during exercise, and thus supplementing with BCAAs helps delay muscle fatigue and improve exercise performance. Branched-chain amino acids (BCAAs) comprise of amino acids Leucine, Isoleucine and Valine and are essential for the muscle synthesis, maintenance and repair. 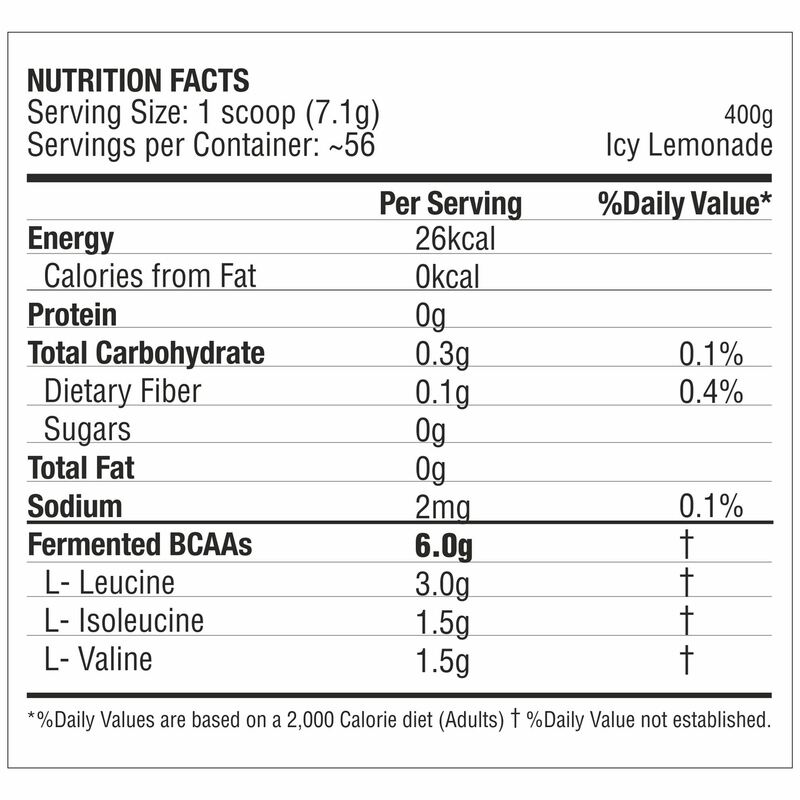 BCAAs are metabolized directly in the muscle and not in the liver, thus they are used as quick source of energy. BCAA can either be used to build new proteins or burned as fuel to produce energy. Of the 3 BCAAs, Leucine is the one which triggers the activation of mTor pathway essential for building muscle. 100% FERMENTED BCAA+ is an All-Vegan Amino Acid molecule manufactured using a unique fermentation process which produces a cleaner, clearer molecule with better bioavailability as opposed to most other Amino Acids on the market. 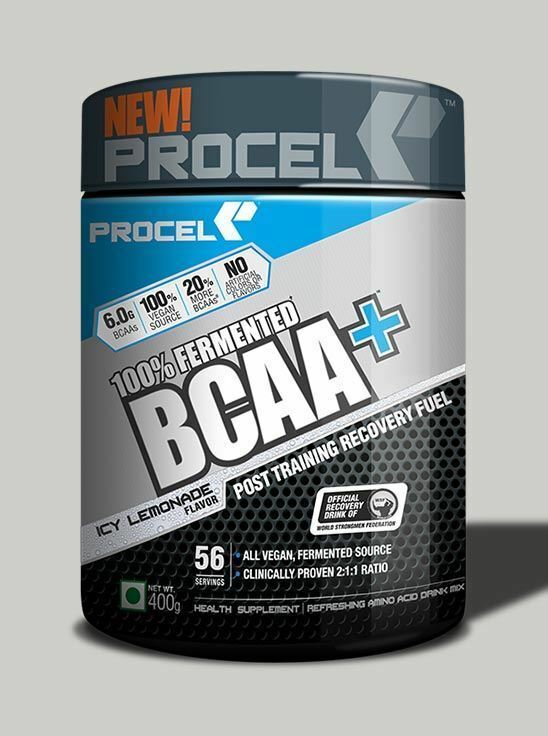 Q.4 What is the benefit of consuming Fermented BCAA? 100% FERMENTED BCAA+ is manufactured using a unique fermentation process which produces cleaner, clearer molecules. It is also Micronized which leads to superior absorption of both the amino acids. It is a simple amino acid product. However, do check other ingredients mentioned on the label to rule out any ingredient which you may be allergic to. Q.6 Can 100% FERMENTED BCAA+ be consumed by vegetarians and Vegans? Whey Protein is a preliminary supplement required for muscle gain. BCAAs are essential amino acids which the body cannot produce. 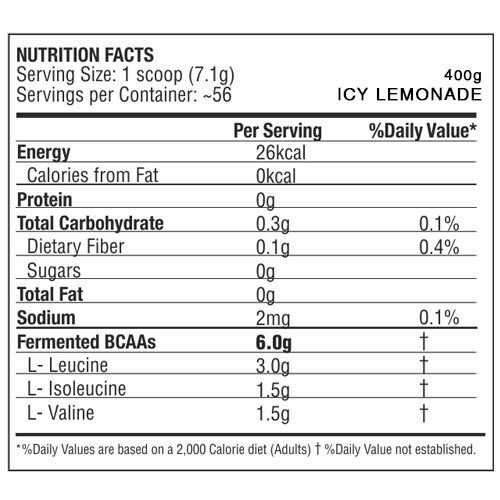 One of the BCAAs, Leucine, is known to trigger the process of protein synthesis. Although whey is sufficient for muscle gain, protein synthesis is directly linked to BCAAs and supplementing with BCAAs can enhance muscle gain and also serve as a great source of energy. I Can Say That This Is Value Of Money. Way More Useful Than You Think! Wow! This Is Really Good. I Was, To Speak Frankly, Little Hesitant To Get An Indian Product. But Then I Thought "Why Not Give It A Try".. And I Purchased It. Would Sure Go For The 2Nd Indian Bottle Once I Finish This One. Easy to mixibility.. Worth trying it.. It Worked Wonders For Me And I Received Genuine Product From Neulife, So, I Was Happy Overall. Great Product, Lovely Consistency And Amazing Taste.